Bob Dylan, here at the Critics' Choice Movie Awards in January, appeared in a Fiat Chrysler ad aired during the Super Bowl. 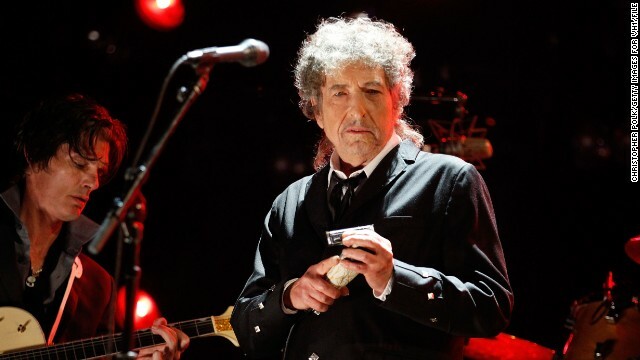 (CNN) -- Oh Bob Dylan, how can the life of such a man be in the palm of some advertiser's hand? Be sure to sing that first line to the tune of Dylan's classic song "Hurricane" and you'll get why it fits. The musical icon stirred a bit of a ruckus on social media Sunday night after he appeared in a Super Bowl commercial for Chrysler while another, for Chobani yogurt, featured his music. The term of choice: "sellout." "I'm sorry. Young Bob Dylan would vomit in the mouth of old Bob Dylan for making car commercials, especially jingoistic ones," said one Twitter user. The Chrysler ad included Dylan asking, "Is there anything more American than America?" Another tweeted "That Bob Dylan, Chrysler commercial was disappointing and sad on so many levels. Proof that there are very few not willing to sell out." Could this be the same artist once known -- to his regret -- as "the voice of a generation"? Oh the times, they are a-changing. However, it's not the first time Dylan has linked up with an advertiser. In 2003 he made an appearance in a Victoria's Secret ad which used his song "Love Sick." According to Rolling Stone, Dylan previously licensed his track "Motherless Children" to be used in a Jeep ad. That brand is also owned by Chrysler. There was also the 2009 Pepsi commercial which aired during the Super Bowl which mashed up Dylan's image and music with Will.I.Am of the Black Eyed Peas. Brian Steinberg of Variety points out that instead of "selling out" Dylan may be merely doing what some of his contemporaries have done in trying to remain relevant in today's music industry. "Put bluntly, with radio formats so narrow and music videos so out of vogue, musicians often have a tough time getting their work heard," Steinberg writes. "For Dylan, an artist whose time in the spotlight was most intense in the 1960s, the feat is more difficult, even if he does continue to release albums that gain plaudits and critical acclaim."